After two years of testing in a graduate class of the University of St. Gallen and a further improved version with all level executives at Swisscom, a major Swiss telecom provider, we have further improved Liechti’s work by summarizing existing survey and meta study insights into three competencies across these 15 fields (five competency dimensions across three competency levels), resulting in 45 distinctive responsible leadership competencies that could be measured and assessed (see below for details). We offer an additional service for universities, business schools and other learning institutions that interested in having data available for a specific cohort, course or program. If you wish to have such data available, please let us know either by reply email or by writing to CARL@bsl-lausanne.ch. You will need to let us know before anybody takes the assessment, so that we can set up a special CODE for you. The associated cost with such an additional service amounts to US$/CHF 280 per report generated and we hope this keeps this tool very affordable. You can undertake a Before / After Assessment of a specific group of participants, as an additional measure to understand the impact of any learning intervention over a given period of time. We are currently closely observing how CARL does in reality and we are anticipating reviews and continuous improvements which will results in possible updates. We shall of course be very mindful of timing such updates in order not to influence any ongoing before/after assessments. It would thus help us in planning to know approximately when you would be planning to do an after assessment, if at all. We are are grateful for the enthusiasm that has been shown of this Assessment and, to those who have actively requested the link, the interest shown in using this first ever attempt of a responsible leadership assessment. We hope that this is yet another, even if small, contribution towards our shared goal of helping to develop globally responsible leaders in any position of any kind of an organization so that business can be celebrated for its positive contribution to serving the common good. The survey takes approx. 5 minutes and needs to be taken without interruption. Once completed, each participant receives a personalized assessment report which includes an overview of the competencies as well as suggestions for learning and improvement in specific areas. 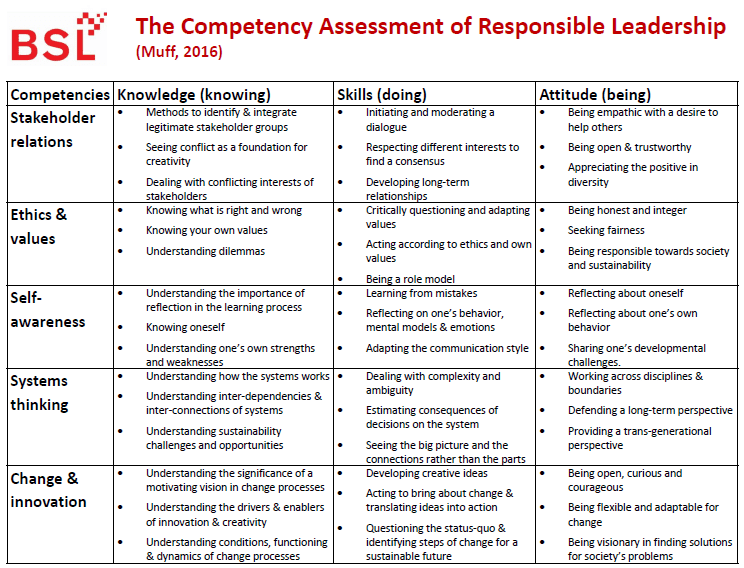 The Competency Assessment for Responsible Leadership (CARL) is now being released for full free public usage after a beta test that allowed calibrating the online tool addressing issues related to social desirability, which are typical for such surveys. The survey takes approx. 5 minutes and needs to be taken without interruption. Once completed, each participant receives a personalized assessment report which includes an overview of the competencies as well as suggestions for learning and improvement in specific areas. Feel free to test the tool yourself first and to share the survey widely among those in your communities who may have an interest in testing and using it. Volunteers for language further translations are gratefully accepted please contact CARL@bsl-lausanne.ch to contribute. Have you tried to just start the test from anew? If it still doesn’t work, are you using your keyboard to press “I” and “E”, or are you trying to click on “I” and “E” on your screen with the mouse? The latter won’t work. If that still does not solve your problem, please try to complete the survey on a different device, potentially with a different browser. There are essentially two possibilities how this can happen: a) You simply do not qualify as a responsible leader, or b) you took too long to answer the questions. Remember that the test takes into account your reaction times. Therefore, we would suggest that you simply do the test again, and answer the questions as quickly as possible by indicating your intuitive responses (first reactions), as only this way of completing the test will provide you with useful information about your true underlying set of skills and attitudes regarding responsible leadership. The test is based on the assessment of reaction times, which necessarily makes the test more sensitive compared to a Likert-scale based survey, for instance. However, the advantage is that you get a more nuanced and honest picture of your skills and attitudes regarding responsible leadership. If you think you made too many mistakes by pressing the wrong button, we would suggest that you simply do the test again. The test is based on the assessment of reaction times while correcting for reading speed. Hence, the result of your answer to a particular question is not dichotomous, but a fine grained score indicating the extent to which your agreed or disagreed to a particular statement, resulting in a more nuanced reflection of your skills and attitudes than standard survey questions could provide you with.